Cicely, the leghorn pullet, was born with a contracted tendon. Her original owner neglected to fix the genetic problem within the tiny time-frame in which it could be done. That left Cicely with only one option for a pain-free life. The sweet leghorn was surrendered to us at Black Thistle Farm when she was 3 months old. Her deformity was very severe. Dr. Knafo at Tufts University suggested that Cicely have her leg amputated. 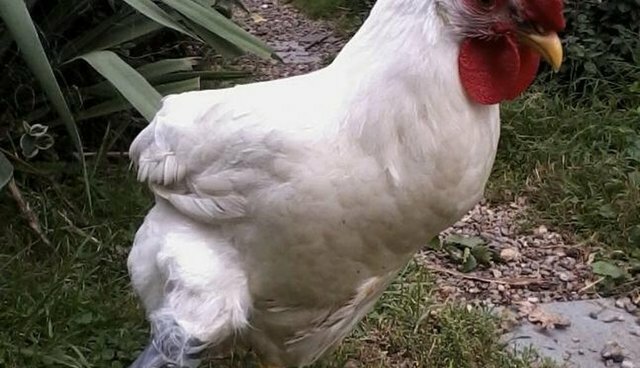 After, she would be the first chicken to receive a full 3-d printed prosthetic leg. While we wait for the leg to be fabricated, Cicely is wearing a "training" leg made from a Market Basket water jug handle! Because Cicely has never walked in her life she needs to develop the physical and mental foundations needed to learn how to bear weight on her weakened leg. Sweet Cicely is an inspiration to so many people. She has an amazing personality and a charisma that is irresistible. She has changed the lives of everyone she has touched- and she has helped us at Black Thistle Farm spread the word about chickens. Visit our webpage to follow Cicely's exciting story as it unfolds -Black Thistle Farm. Read about Cicely's journey - Interview with Melissa Caughey (Tilly's Nest).